When Horace Greelee said “go west young man”, J.R. vanLienden must have been listening, because he’s gone into the Old West Wagon Train business. But he’s not making wagons for pioneers and teams of horses. J.R.’s wagons are scaled down for kids and are powered by the ‘horses’ under the hood of a garden tractor or riding mower — an “amusement ride for home or business,” he says. 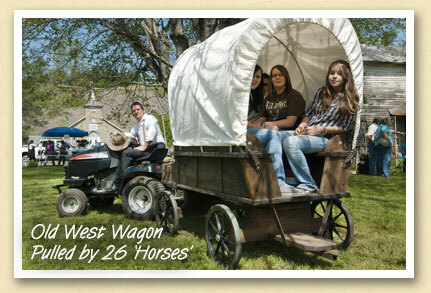 At the recent “Green Thumb Day” festival in Whittier (above), J.R. offered free rides on one of the wagons. And he says several can be strung together for a ‘trackless train’. J.R. makes his wagons in the old Whittier School. You’ll find more information on his website, TinkerMania.com.